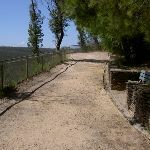 From the information sign at Evans Lookout car park, this walk follows the ‘Evans Lookout’ sign down the steps. The track passes a stone shelter on the right as it reaches the railed lookout. 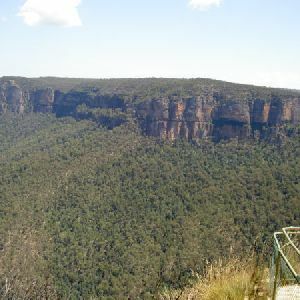 Evans Lookout, Blue Mountains National Park, looks over the spectacular Grose Valley, with its deep gorges, green forest and prominent cliff lines. The fenced lookout is at the end of Evans Lookout Road. There is a rock shelter hut and toilets. Turn sharp right: From Evans Lookout, the walk heads down the steps, passing the ‘Grand Canyon’ sign. From the bottom of the cliff stairs, the walk tends left onto the spur where it continues downhill and weaves past some boulders to a signposted intersection. 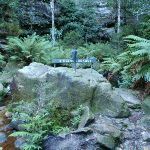 Veer right: From the intersection, the walk heads down the stairs into the gully following the Neates Glen and Grose Valley signs. The walk winds down the hill for approximately 100m to a railing. From here, the walk continues down the other side of the gully, winding down the hill for a short while. The walk then continues down the right-hand side of the gully to drop onto the creek with a signposted rock in the middle. Veer left: From the intersection, the walk follows the signs to ‘Rodriguez Pass’ around the canyon side, with the creek on the left. After about 200m, the track crosses the creek. The walk follows the white arrows painted on the rocks winding down between, around and under large boulders for approximately 100m. The track then heads out of the pass, keeping close to the cliff line before winding down the hill to Beauchamp Falls. 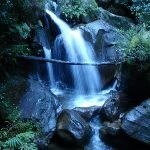 Beauchamp Falls, Blue Mountains NP, is a beautiful set of falls, split by the rock in the centre of the creek. The falls are created by Greaves Creek, which comes out of the Grand Canyon, above. 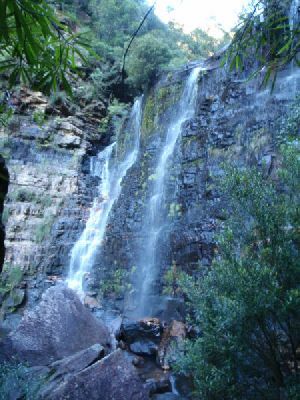 The falls are approximately 10m tall, with rocks at the base. Continue straight: From Beauchamp Falls, this walk heads down the hill keeping the valley on the right. The track winds through and around boulders to then meander with the hillside. 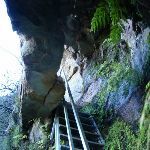 The track winds for some time before descending more steeply, passing a section of rock overhangs which litter the ground with blocks of sandstone. The track passes this area and continues more steeply to a railed section of stairs which drop to a creek, which it crosses to the other side. Continue straight: From the creek bank, this walk crosses to the other side of the creek. The track then turns left, heading downstream, following blue signposts and white arrows down the valley. 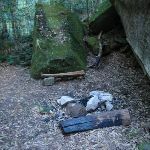 The track soon passes a boulder with a large plank underneath it, set up as a seat, before passing a large mossy boulder. 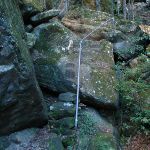 Approximately 300m on, the track passes another large mossy boulder with a white arrow at the bottom of the stairs. The track then continues down the hill, crossing the creek to a small clearing next to the creek, in which the track turns right and undulates across the hillside. The track drops into a few creek beds before climbing down a few stairs to an intersection at a campsite on the right. Continue straight: From the intersection to the camp area, this walk heads downstream along the creek flats, below on the right of the track. The track then leaves the creek flats to wind and undulate higher on the hillside for approximately 600m, passing a few clearings with fireplace on the left. The track passes a brown arrow with ‘Horse Track’ scratched into it, and soon after comes to an intersection with a sign, with an arrow pointing back to ‘Grand Canyon’. Continue straight: From the intersection, this walk heads downstream following the sign to ‘Junction Rock’. The track soon passes a small clearing before climbing higher on the creek bank. After some time undulating, the track comes back onto the creek flats and continues to a section of cliffs on the left. 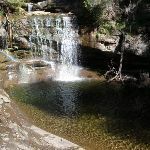 The cliffs are passed by the track across the rockshelf next to a pool in the creek. The track soon turns left to Junction Rock, in the middle of the creek after the rock shelf. 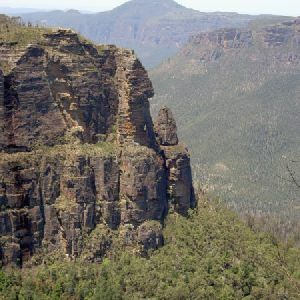 Junction Rock, Blue Mountains NP, is a rock situated in the middle of the Govetts Leap Brook and Govetts Creek junction. 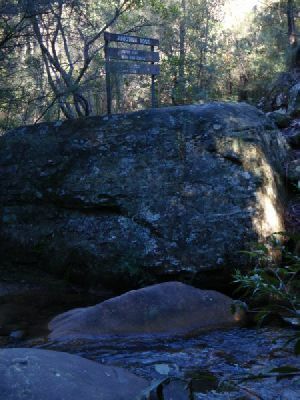 The rock is signposted, giving directions to Evans Lookout, Neates Glen, Acacia Flats and the Blue Gum Forest. Junction Rock is a great place for lunch and a swim in summer. Turn left: From Junction Rock, the walk follows the ‘Govetts Leap’ sign, soon crossing the brook. 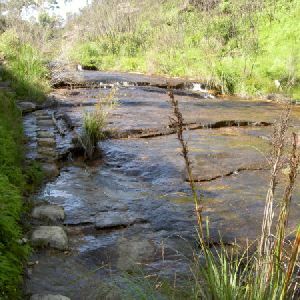 The track then follows the brook for approximately 150m, to another creek crossing. The track continues, with the creek now on its left, for approximately 60m, before crossing back to the other bank. 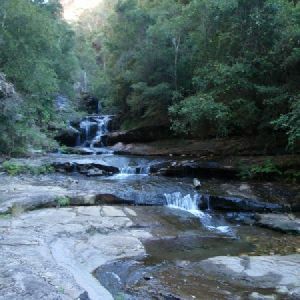 The track continues for approximately 1km with the creek to the right, and undulates steeply in sections between magnificent waterfalls. 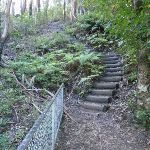 A section of track traverses a rock shelf for a short stretch, before continuing to wind up and down (with the creek to the right) to a few sets of steeply-cut stairs. From these, the walk continues to wind over hills to a creek crossing. The track then heads up the spur, winding between views of waterfalls, before tending left further up the hill. 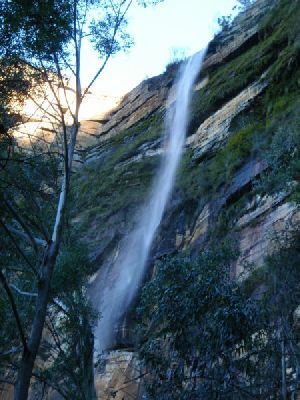 The walk leads up the winding steps for some time, until crossing the creek at the bottom of a waterfall cascading off the large cliffs – Govetts Leap falls. Govetts Leap, is a waterfall in the Blue Mountains National Park. The fall is fed by Govetts Leap Brook which runs over the cliff into the Grose Valley. The falls are best viewed from Govetts Leap and Barrow Lookouts. Leap is a scots dialect word for cataract or waterfall. Continue straight: From the bottom of Govetts Leap Falls, this walk heads north-west, following the blue signs up the hill. The track zigzags its way steeply up to a wall of rock covered by moss, ferns and grasses. The track passes along the base of this cliff to a metal staircase, passing through the rock. The track continues to wind steeply below the cliffline, passing two lookouts before coming to the signposted intersection. Continue straight: From the intersection, this walk follows the sign to ‘Govetts Leap carpark’ up the stairs. The walk zigzags up the hill before tending left to the signposted intersection. Turn left: From the intersection, this walk heads across the grassed area towards a platform structure. 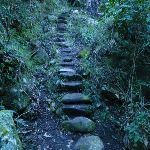 The walk climbs some stairs onto Govetts Leap Lookout, with its great views and sandstone monuments. Signposted accessible and general use male and female toilets. Access via concrete ramp, however, the top of the ramp is accessed via loose gravel carpark with some steep eroded sections. Picnic shelters at the end of Govetts Leap Road. Seats are ~45cm high and benches 75cm high. Most shelters have an entrance ~1.2m wide with, and similar gap between table and wall. The largest shelter has an entrance wider than 4m, bench seating but no tables. Continue straight: From the intersection, the walk heads up the hill, following the sign to ‘Evans Lookout’ and keeping the Grose Valley below on the left. The track rises for approximately 400m and then heads down the hillside. 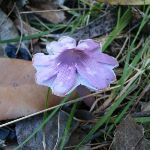 The walk zigzags down the hill, with stairs, and then crosses a creek with cement steppingstones, coming to a signposted intersection on the other side. Turn left: From the intersection, this walk heads up the winding stairs towards the cliffs. The soon comes to the railed Barrow Lookout, where there is a bench seat. 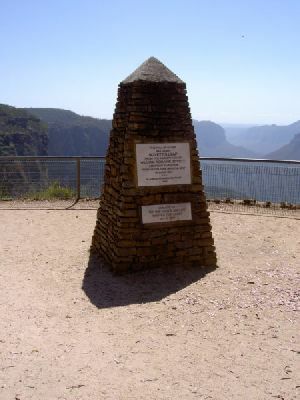 Barrow Lookout, Blue Mountains National Park, looks down to Govetts Leap falls and across the Grose Valley. The lookout is fenced and has a bench seat to rest. Continue straight: From the lookout, this walk heads up the stairs, keeping the valley below on the left. The walk winds up the stairs for quite some time, then flattens out along the cliff top. This walk continues along the flat for approximately 100m before climbing up more stairs for approximately 200m, to a bench seat at the intersection. If the track begins to descend after the bench seat, then you have gone too far. Veer left: From the intersection at the bench seat, this walk heads down the hill, with the valley on the left. The track flattens out for approximately 100m before swinging right, into a gully. The track climbs out of the gully and continues to undulate around the hillside for approximately 500m. The track then descends steeply into ‘Haywards Gully’ which has a boardwalk bridge. 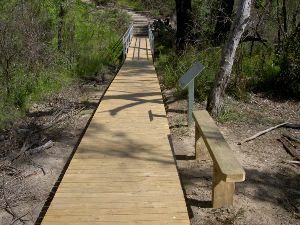 This walk follows the wooden boardwalk for approximately 30m, then continues along a flat, dirt track for approximately 60m. The track then climbs up the hill for approximately 100m to Evans Lookout car park. Turn left: From the car park, the walk heads to the other end of the car park (towards the lookouts), to the intersection on the left of the information sign. 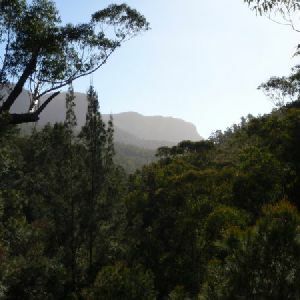 Hayward Gully, Blue Mountains National Park, is named after the first white man, William Hayward, to reach the floor of Govetts Gorge, in 1847. 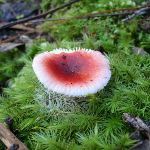 The area is a small gully along the Cliff Top Walk between Evans Lookout and Barrows Lookout. 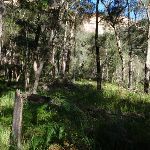 The gully is a quiet place, with a bench seat to enjoy the flora and fauna, and views through the trees into the Grose Valley. 5km of this walk has short steep hills and another 5km is very steep. The remaining (90m) has gentle hills with occasional steps. 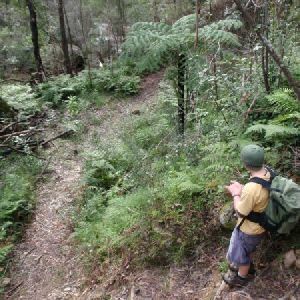 6km of this walk follows a formed track, with some branches and other obstacles and another 4.9km follows a rough track, where fallen trees and other obstacles are likely. 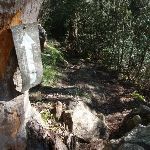 The remaining (250m) follows a clear and well formed track or trail. 6km of this walk has directional signs at most intersection and another 4.8km has minimal directional signs. The remaining (250m) is clearly signposted. 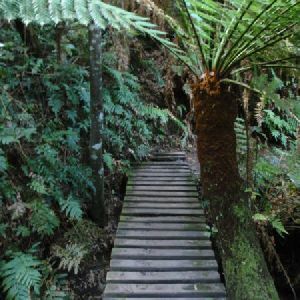 Around 7km of this walk requires some bushwalking experience, whilst the remaining 3.5km requires no previous bushwalking experience. This whole walk, 11km is not usually affected by severe weather events (that would unexpectedly impact safety and navigation). 6km of this walk has limited facilities (such as not all cliffs fenced) and another 4.3km has limited facilities (such as cliffs not fenced, significant creeks not bridged). 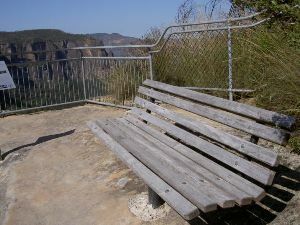 The remaining (310m) is close to useful facilities (such as fenced cliffs and seats). 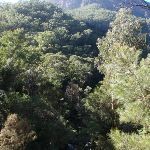 A list of walks that share part of the track with the Evans Lookout to Junction Rock walk. 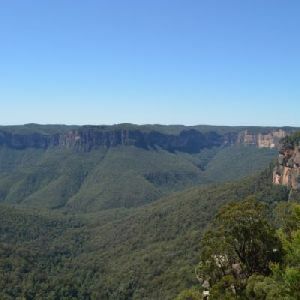 This walks starts from the spectacular Govetts Leap Lookout and wanders along the cliff tops, before dropping through a creek, to reach the much smaller Barrow lookout, with equally spectacular views. 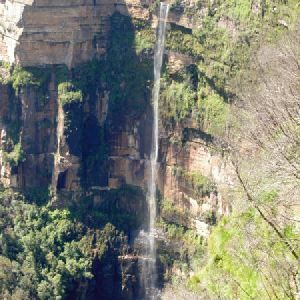 Barrow lookout provides the bonus of clear views of Bridal Veil falls (Govetts Leap brook). You can also see the face of the cliffs below the Leap from this lookout. 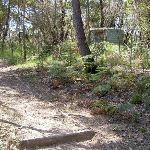 The Braeside Walk is an excellent connecting trail to the Cliff Top walk, between Evans and Govetts Lookouts. The track has its own quiet picnic area, which could make a nice spot for lunch along this creekside walk. 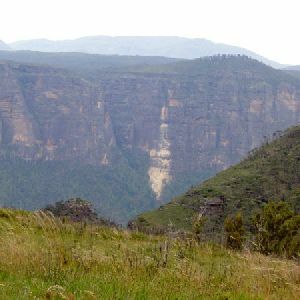 The track builds up to its climax at Barrows Lookout, overlooking the Grose Valley and Bridal Veil Falls, before returning along the same track. 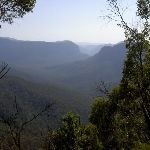 The walk from Evans Lookout to Beauchamp Falls is magical journey, passing through the bottom part of the Grand Canyon. The views from Evans lookout are stunning, with the lush canyon environment providing a very different environment to enjoy. The walk then continues down the creek to Beauchamp Falls. If you don’t have the time to do the whole of the Grand Canyon walk this is a great compromise. 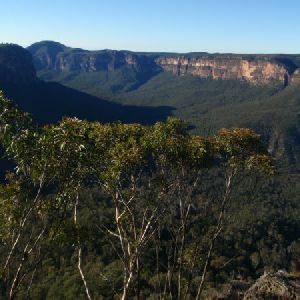 The Cliff Top Track is a breath-taking walk around the edge of the Grose Valley, between Govetts Leap and Evans lookouts. 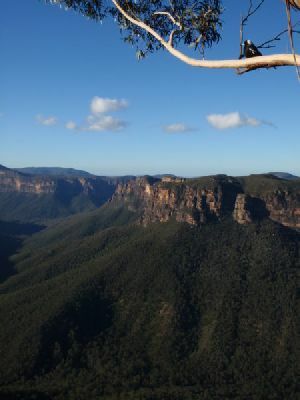 The many lookouts along this track show off the stunning Grose Valley. 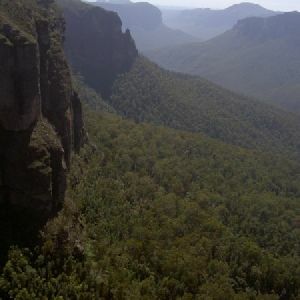 The track also showcases Govetts Leap from close up, at Barrows Lookout, and further away, from Govetts Leap Lookout. 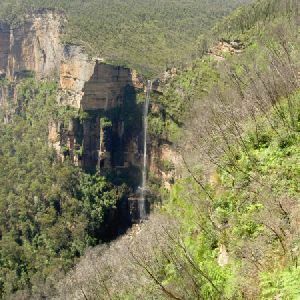 This walk takes you from Govetts Leap lookout, around the cliff tops, to Pulpit Rock lookout. 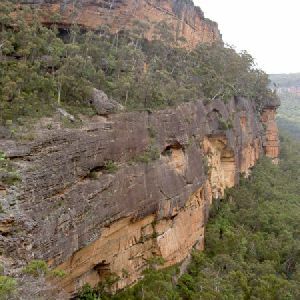 The walk passes many lookouts, each giving their own unique perspective of the Grose Valley’s dramatic cliff line and waterfalls. The walk down to the lower platform of Pulpit Rock is via a set of steep stairs, the view varies at each of the three levels. This section of the Cliff Top Track takes in the beautiful scenery east of Blackheath. 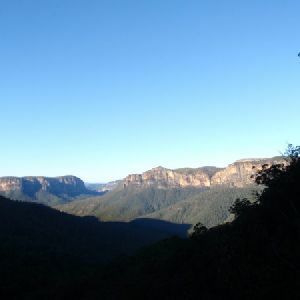 The track leaves Pulpit Rock car park and drops into many lookouts with views over waterfalls and the Grose Valley. 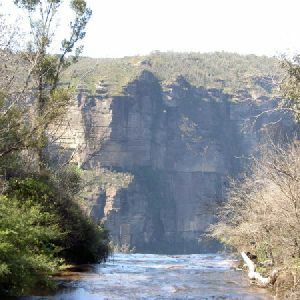 The track heads out to the secluded creek bank of Boyd Beach, and then continues, back along the track, and climbs to the magnificent views from Govetts Leap Lookout. This classic walk was first established in 1907, taking walkers along the path of a canyon. In places, the track follows a path cut halfway up the cliff, keeping you out of the most dangerous section of the canyon. The creek does flood after heavy rain, so check with the National Parks office before heading into this walk. The cool temperatures in the canyon make this walk particularly special on warmer days. This walk could also be known as the long way round to Beauchamp Falls. The Horse Track is poorly defined towards the bottom the walk and may challenge your navigation. 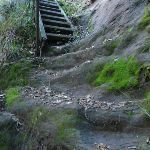 This walk explores Govetts and Greaves Creeks and the Beauchamp Falls. The western section of track is part of the Grand Canyon walk. 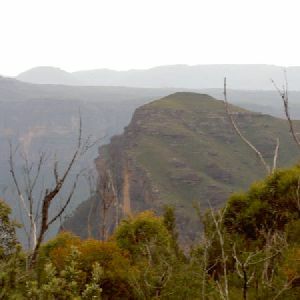 The Cliff Top Track is one of the longer walks near Blackheath, and has constant views. 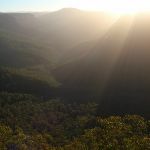 The track follows the rim of the Grose Valley, with a side trip to Boyds Beach, and passes numerous lookouts with views of the Grose Valley and it’s waterfalls. 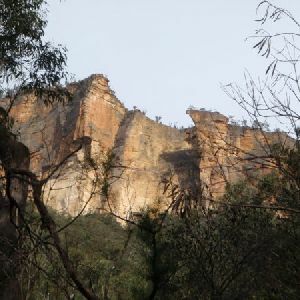 This walk is an excellent one way trip from Pulpit Rock to Evan’s Lookout car park. This walk is an excellent way to see some of Blackheath’s best views, without the big climbs in and out of the Grose Valley. The round trip from the station shows off Bridal Falls, and other cascades along the cliffs. A large part of this walk is near the cliff edge, with stunning views spanning out across the Grose Valley. 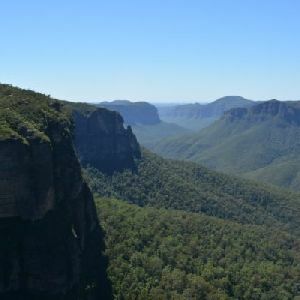 This walk, from Blackheath Train Station, is a fantastic way to see some of the iconic areas of the Blue Mountains in the Blackheath area. The walk heads through Pope’s Glen to Govetts Leap via a wonderful stroll along the creek, before breaking out to the views of the Grose Valley. 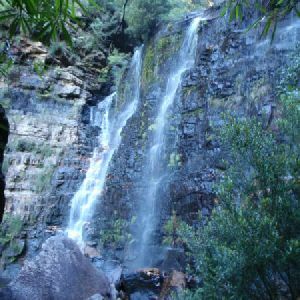 The stunning views over the valley, waterfalls and bush make this a great walk with public transport access. The Grand Canyon, Cliff Top and Braeside tracks are an excellent way to see the great diversity of the Blue Mountains National Park in the Blackheath area, from the Neates Glen rain forest, through the void of the Grand Canyon, to the separation of plateau and valley by the Cliff Top walk. 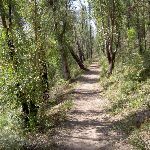 The walk then finishes with a creek-side stroll along the Braeside Track. It truly is a wonderful walk. 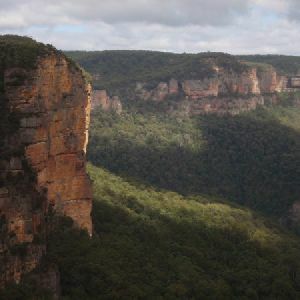 This large circuit walk, from Popes Glen to Pulpit Rock, Govetts leap and along the Braeside Track, passes some of the most magnificent scenery in this part of the Blue Mountains National Park. 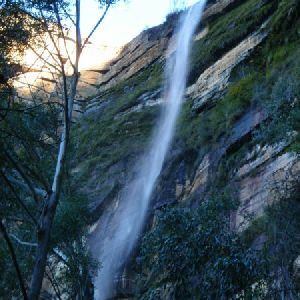 From little, hidden places, like Boyds Beach, to the stunning Bridle Veil Falls and Govetts Leap Lookout, this track covers many of the areas highlights. 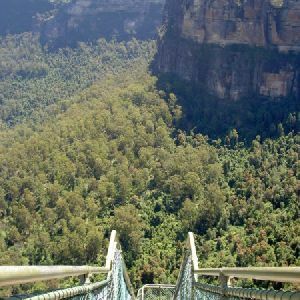 This walk is a fantastic way to see many of the highlights of this part of the Blue Mountains National Park. 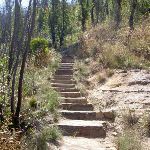 The only major descent and climb on the walk is on the section through the Grand Canyon, which is an experience in itself, especially if you’ve never been in a canyon before. The track then continues along the cliff tops with excellent views over the Grose Valley and surrounding cliffs. The vegetation change along these sections is interesting, with areas of drier and wetter foliage dispersed along the track. 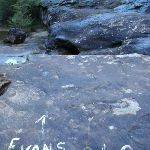 A list of walks that start near the Evans Lookout to Junction Rock walk. The walk to the summit of Flat Top is a very short climb. A treat awaits at the summit, with a near-360 degree view of the surrounding valleys, including the Grose Valley. There are also great views to other features including Mt Hay and Lockley Pylon. The walk and mountain itself may be short, but the views are spectacular and well worth exploring. Lockley Pylon Track is an outstanding walk, offering some amazing views and interesting side trips. 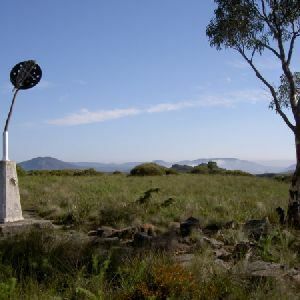 From Mt Hay Rd, the walk passes the prominent features of the Pinnacles (with an optional side trip exploring these) and climbs to Lockley Pylon, which gives 360-degree views of the Mt Hay area and Grose Valley. 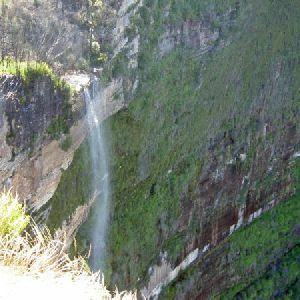 Another optional side trip to Fortress Canyon Waterfall is well worth the walk, with its contrasting plateau, cliff and valley features creating some breath-taking scenery. This walk takes in the fabulous views across the Grose Valley. It covers the combination of the upper lookout, providing the easiest access, the middle lookout, and the lower lookout, which involves many more stairs. The upper lookout gives the best views across the valley, while the middle lookout gives similar scenic views. The lower lookout, however, has great views of the cliffs around the Grose Valley from a unique perspective. 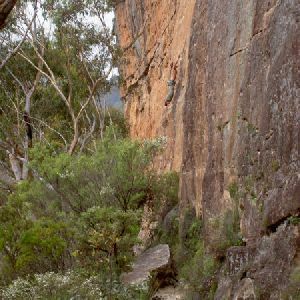 This track meanders down from the car park to take in the stunning views of the Grose Valley. The track passes a picnic shelter on its way to the upper and middle lookouts of Pulpit Rock (there is a lower lookout, with many more steps). The lookouts provide great views across the valley. 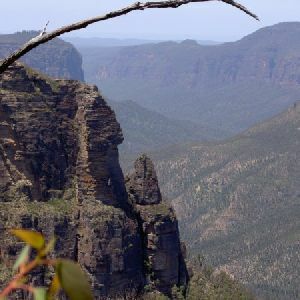 This walk follows a distinct track to the top lookout, the easiest of the three lookouts at Pulpit Rocks to visit. The track passes a picnic shelter on the way down from the car park. 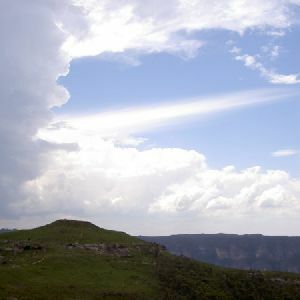 The lookout has stunning views across the Grose valley, and down onto Pulpit Rock. A fantastic return walk with stunning views, this track leads along the Fortress Ridge, out to the cliffs above the Grose Valley. The views from the lookout and along the trail are superb, with the sheer cliffs and a deep valley to put it all in perspective. The track is popular with canyoners, who use it to access Fortress Canyon. This side trail from Fortress Ridge provides access to a fantastic lookout with breathtaking views along the valley and of the amazing sandstone cliffs. The walk to the lookout is mostly along management trails through the lovely heath. 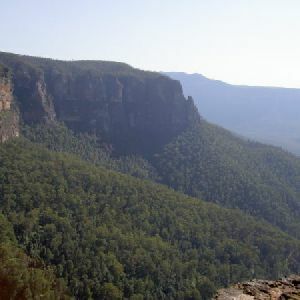 The views from the lookout extend across the large valley (Govetts Creek) to the cliffs on the other side, including to Pulpit Rock. This is a short but sweet circuit walk above, then below, the cliff line. The track passes under the cliff line for some time, with views over the Kanimbla Valley. Climbers will love the great access to the walls, while walkers will enjoy the scenery and flowers in the heath. This circuit walk covers many of the tracks just to the west of Blackheath. 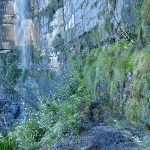 The walk follows the cliff lines, both above and below, with amazing views of the Kanimbla Valley, rock features and waterfalls. 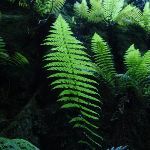 The walk takes in a cross section of plants, with defined changes through the cliff passes. 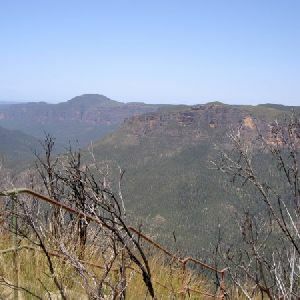 http://new.wildwalks.com/wildwalks_custom/includes/walk_fire_danger.php?walkid=nsw-bmnp-eltjr Each park may have its own fire ban, this rating is only valid for today and is based on information from the RFS Please check the RFS Website for more information.